Blimey! what happened to August? It’s been a strange summer what with hospital visits eating into my time, meaning I have to squash the rest of normal life into what’s left….and then try and do some art. I have decided that for the rest of this year (and beyond who knows? )I am going to focus as exclusively as poss on what I like doing best – painting in the studio. I have an absolutely huge backlog of ideas I want to try. Doesn’t get any smaller and won’t unless I spend some more time in there. I think I’ve finally gravitated down to what my best art is all about. Can’t get rid of my tendency to “play around” with serious representational stuff so I am going to accept and embrace it. Most of my art from now is likely to be a mixture of realism and surrealism (with the occasional dash of abstract/expressionism). Of course that doesn’t include commission work. As you might know I have been busy with my latest commission for the South Wingfield & Pentrich Revolution Group – all to do with the approaching bicentenary of the 1817 Pentrich Revolution. What I never realised was the involvement of so many other villages’ folk. 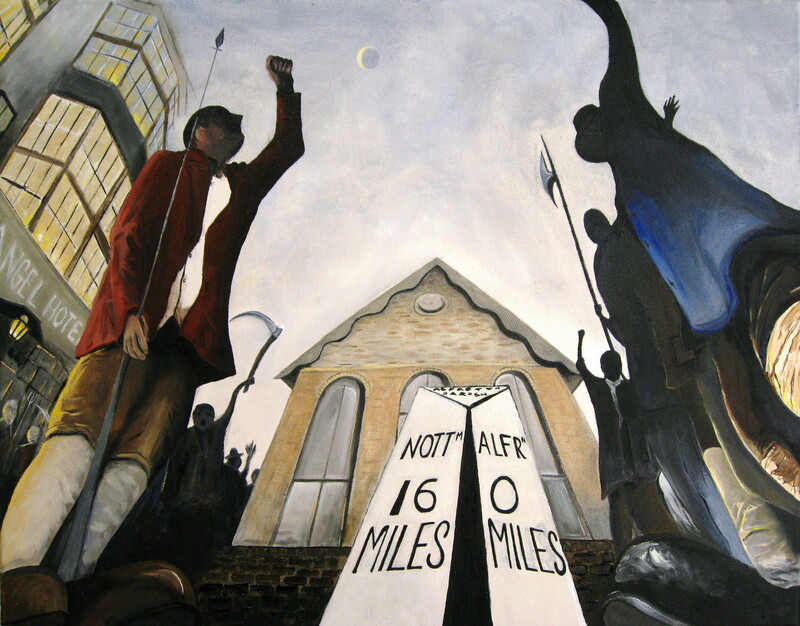 My artwork “Alfreton arise!” has been coming along and celebrates that town’s involvement in insurrection. Had a tough time researching suitable backdrops/buildings etc that may have survived but finally come up with a composition that is both recognisably Alfreton …and dynamic/believable. Had to include the old Moot Hall and Angel Hotel – and as unlikely as it is that the revolutionary group would have gathered on the market place, I’ve used artistic licence to try and use the location to breathe atmosphere into the piece. I have to admit I am enjoying doing it and I’m pleased with the outcome so far.